Ludo stepped back as Stephen barged past him and braced himself, half expecting something to happen to Stephen. After a few seconds he realized that nothing was going to happen and that Stephen in his haste was almost at the top of the stairs. Shrugging his shoulders and muttering to no one in particular “amateurs”. Following Hasan and Stephen to the top of the stairs, he glanced back and was reassured to see Feldard and the others trooping up the stairs. Ludo guessed that as they were now moving up that they might be within the tower itself, and much closer to Vlaak and the mysterious man in the yellow robes. Stephan mounted the dusty stairs — the cubes had not done their work here! — in reckless haste. At the top, however, his senses came back to him. Faced with a door, he stood back on the landing to allow Ludo to practice his skills. As Hasan reached the top, the fighther tried to squeeze into the corner to allow the elf to also examine the door. Stephan hissed down the stairs at Feldard, “Aye, best close that door. Don’t want any of that goo creeping in.” Some part of his brain knew this was a ridiculous thought but he felt better with the door shut nonetheless. As the others had made their way through the doorway the priest took the opportunity to ensure the lower gate to the street was secured. Satisfied, he made his way back to the stairwell and with one last scan for anything that lay in the oozing mess, he followed the party, closing the door behind them. There wasn’t much room on the stairs. “This is cosy.” he remarked to no one in particular. Ludo examined the door. From the other side, he heard the sound of a low growl. “Be quiet, you are all making too much noise” Ludo whispered. “I hear a growl on the other side of the door, I think we might have some guard dogs to deal with, or possibly some Gobbo wolves. Be on your guard”. Ludo stepped back to allow Feldard past and got out his bow and notched an arrow. Stephan readied his shield and sword. He clutched his light stone in his left shield hand. “I must affix it to my shield, some day,” he thought to himself. He could see that Ludo sensed something beyond the door. The rogue’s body took on the lithe, cat-like awareness of a feline on high alert. Stephan held his breath and tried to remain perfectly still. All his focus was on Ludo’s reactions to the door. After securing the outside door, Feldard had returned to the party, a bit miffed still that he’d not had opportunity to even attempt a swing at the gelatinous cubes that had frightened human. But his sour musings were met with an offer to take up the lead. Ha! Of course when there was a certainty of battle – send in the dwarf first. Some might feel bothered by that, but Feldard knew it was because they trusted him to deal with whatever lay ahead. Miklos stood on the stairs and caught the rogues’ urgent comment. He smiled, all a growl would indicate was they wouldn’t be surprising anything. No surprises there. “Ahh here we go,” he smiled again, as Feldard mounted the steps. The dwarf paused for just the barest of moments at the door, untethering his battle axe and ensuring that the others were prepared. Then with a nod, he opened the door. The marble walls and tiled floor of the chamber were dulled with age. Statues of jackal-headed men stared blindly from their plinths by the walls which were robed in dust. Faded curtains hung on the north and west side. A double door was the main exit to the east, and another door was in the southwest corner. A fountain in the center of the room was dried up and filled with rubbish. However, there was scarcely any time to look about, for inside the chamber was the largest wolf he had ever seen. It was about the size of a pony! With snow white fur, the wolf glared at him with intense icy blue eyes. The wolf immediately sucked in a deep breath, held it, and then released a blast of icy air directly at the dwarf. The mage looked around and nodded, he was picking something interesting out from the mess. Feldard was typically silent. His face set with his usual unhappy glower. He could still feel a bit of the static charge in the air after that… display. It made his beard itch. While Ludo and Miklos, scrounged for items, and Hasan scouted ahead, the dwarf made his way back to the entrance to check if the crack of lightning had drawn attention from more scouting parties, or if the goblins in the building beside had managed to find exit from the wizard locked doors. Ludo re-entered the the Cubes lair treading carefully through the glumps of goo. Amongst the globs of geletine he spied a small object lying in a corner, a gemstone. “He picked it up and whispered to Miklos” seems the cubes cannot digest everything”. Moving on he approached the door that Hasan had discovered. Sweating and obviously embarrassed, Stephan tried to compose himself and get his gear together. He tried to quietly make his way to where Hasan listened at a new door but he was plagued by involuntary and sharp inhales of the acrid air. Each time he did the hiccup-like sound, several of his companions jerked their attention to see that the woodsman was all right. Clearly they were not convinced the fighter would not again lose control. Along the way, Stephan found his lightstone glowing under globs of the goo. He considered leaving it….not really having the stomach to dig it out. But with a prayer for strength, he was able to use his sword and boot to free the stone. Then, with a gloved hand, he steeled himself to pick it up and wipe some of the gunk off. Little did he know that a fairly large mass of the stuff still clung to his helm, wobbling above his eyes. Using the stone to guide him, he did not bother with searching the gelatinous mess and instead sought Hasan and the exit. Perhaps a little louder than he intended, he said, “We’ve no choice. We should leave here.” And with that, he shouldered past Hasan and Ludo, and opened the door. In front of him was a dark hallway. To his right, a set of stairs leading upward to a door. Those who happened to see Stephan’s face saw it go a ghastly white. Hasan clearly saw the odd change in the human who suddenly did seem his solid self. “I, I, I…no!” the fighter nearly babbled to himself while taking faltering steps backwards. “We can’t…the, the…” Stephan’s sword clattered to the stone floor sending tinny echoes off the polished walls. A part of his mind put it together…the tidy floors and walls. No debris. It all meant the one thing Stephan could not stand. The one thing that nearly took his life all those years ago. Nearly ended his days not in the grit of battle that he always knew would be his end. But in a slurping, popping hissing, dissolving mindless terror. He had his weaknesses. His faults as a warrior. And before him now his greatest fear loomed in painful reality. This was no nightmare….but it was. And just like in his chilling nightmares….he could do nothing but flee. Dropping his lightstone and shield as well – it would be no use against this foe – Stephan clutched at his ears as the hideous cubes blorped forward to continue their cleanup operation. “Noooooooooo!”, he screamed and backed into a wall. Using the wall as a rough guide, he stumbled along it, trying to get away. Tripping to his knees, he briefly crawled like a frightened child before again gaining his feet and running headlong into a wall. Being too strong for his own good in this situation, Stephan delivered himself a crushing blow to his helmet which turned askew on his head, covering his eyes. The knock was hard and the fighter fell unconscious to the clean dungeon floor. Feldard, still at the doorway, heard the man’s panicked cry. The dwarf took a cautious glance back outside and seeing no immediate threat amongst the ruins, turned towards the immaculate passway and hurried to give aid to his companions against whatever threat had the human screaming in fear. Feldard longed to push his way through to the front of the group, but from the sounds of things weapons were not of much use in fighting these things. So instead, the dwarf strapped his battle axe to his pack and grabbed hold of the downed fighter and began to drag him back out of the way. Ludo observed Stephens reaction in amazement, no help coming from our valiant fighter was the thought that flashed through his mind. Turning towards the massive cubes he recalled what he had overheard in the whispered conversations amongst the practitioners of his trade about these strange creature. They attacked all living creatures, were relentless in their pursuit of satisfying their hunger and were capable of paralyzing their prey while slowly digesting whatever they had caught. All in all not the sort of thing to mess with in melee. Ludo wished he had a torch lit, these creatures might be more hesitant to attack if they were facing fire. Backing up to the corner so as to provide cover, he quickly dropped his lightstone on the ground, sheathed his sword and equipped his bow. Pulling hard on the bow string he let fly an arrow at the closest cube, resistance would be futile for these massive creatures, they were so big he couldn’t miss. Hasan saw the thief’s arrow lodge harmlessly, but the elf knew he had a more potent weapon at hand. he quickly summoned a magic missile and slammed it into the curious foe. To little effect, as the strange ichorous being continued to close the gap on the retreating figures of Feldard, Ludo and the helpless Stephan. The party scattered. Miklos’s eye’s where drawn to the the shimmering things that drew from the recesses of the corridor. They reached from floor to ceiling, bending the light from their stones as if looking through an impossible wall of water. Undigested corroded things floated within these walls. He watched Maruc pulled the dazed woodsman past him. His battlegear strewn on the floor in his attempt to flee. “Cover your ears and eyes lest you be deafened and blinded!” He drew one of his precious glass rods from the folded of his robe and swiftly focus the magic that would be their best hope. Lightning filled the corridor, bouncing off walls ceilings, floors. The world was suddenly etched in white and black. All colour was bleached from the scene for the moment that stretched for eternity. The sound in such an enclosed space silenced the world in a terror of noise. Stephan sputtered back to consciousness. He heard Maruc saying something about “…another day” and thought, ‘good, we’re retreating’. As the cleric led him out, he faltered in sickness. In near shock, his body felt as if in deep fever. He shook his head to get his wits about him but at doing so felt a wave of pain. Maruc had to catch him from falling against the wall. Ludo, seeing the party retreat, grabbed his dropped light stone and ran back towards the entrance of the crypt, coming out into the night air he gulped some fresh air. Turning towards Hasan, he commented with a hint of sarcasm, ”Well, that was successful”. The walls were covered with little bits of burnt gelatin and the corridors smelled of sulfur. Stephan’s weapon and shield were in need of a good scrubbing, but were otherwise intact. Gooey rocks and debris, the former contents of the cubes’ bladders, littered the floor. Ludo agreed with Maruc’s comments. This seemed a likely place to meet the undead. It had the same atmosphere as the family crypt that his older brother Antonio had locked him in when he was younger. He didn’t like it then and he had a bad feeling about this place as well. He moved to the left hand side of the wall and allowed Maruc to take the lead with Hasan. Ludo did however think it odd that the crypt was so well kept, not a piece of debris in sight, in his experience the Undead usually did not pick up after themselves. Focusing on the job at hand he looked out for traps and pitfalls. Stephan kept a firm grip on sword and shield. He tried to keep his light stone handy but gave priority to minding his armament. Ludo whispered back to Feldard “Well without cobweb, at least we can assume there are no spiders around”. Maruc stepped forward steadily. The alcoves eventually a passage leading leftward. With a short pause for a breath of air, the cleric led the party around the bend. Hasan’s own pace slowed as he let the cleric take his place in the lead rank. Falling in beside Stephan, he gave a bright nod. The human merely fidgeted aimlessly with a cord around his neck. Hasan fingered the Ring of Elyas he bore himself, and wondered what burden the human carried. With Feldard nearby, the young mage lingered, closely examining the alcoves the rest of the party had passed by, trying to learn more about the men who had built this ruin they explored. They made their way through the alcoved passage. Every nook and crany was completely cleaned out. The cleric was prepared to face off against the undead. He listened closely for the sounds or bones scratching against stone, or zombies clawing against the earth. 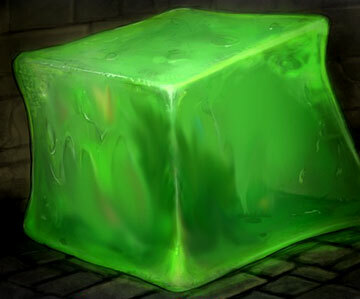 What he heard instead was a oozing, slurping noise as two gelatinous cubes emerged from the alcoves on either side of him.